Almost anything goes with chocolate, it seems. Last weekend at the San Francisco Chocolate Salon, I tasted delightful chocolates combined with Guinness, jackfruit, bacon and genmai tea – in separate confections, thank goodness. Even the Van Gogh vodka infused with dusky Dutch chocolate, which I sampled with some trepidation, was lovely. 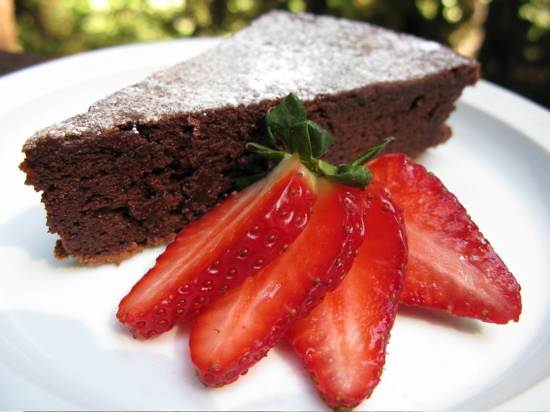 It shouldn’t be surprising then that dark chocolate and peppery extra virgin olive oil make such a stunning marriage in the almost flourless cake from Fran Gage‘s just-released book, “The New American Olive Oil” (Stewart, Tabori & Chang, 2009). The single-layer cake is at once dense, moist and amazingly light, with the silky smooth texture of velvet. Just enough of the oil’s pungent bite hovers in the background to highlight the chocolate’s subtly fruity character. I may never go back to butter. A respected baker who once owned a pastry shop in San Francisco, Gage knows chocolate. A few years ago, she wrote “Chocolate Obsession” ( Stewart, Tabori & Chang, 2005 ) with Bay Area chocolatier Michael Ricchiuti. Her palate is so finely tuned that she was asked to join the taste panel of The California Olive Oil Council, the trade organization that determines which oils from the state’s three dozen mills qualifies to be labeled as extra virgin. She now judges olive oil competitions. 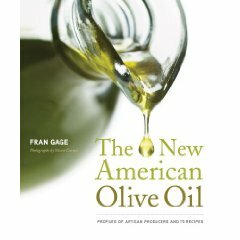 “The New American Olive Oil” tells the story of artisan oil in California and profiles producers large and small. It’s a good resource for people who want to delve deeply into the subject and is filled with advice on choosing, storing and cooking with oils that range from buttery and mild to peppery and assertive. The 75 recipes, however, are the book’s real treasure. Gage uses extra virgin olive oil for everything, including frying eggs for a French-style salad of sauteed frisee. She braises pork shoulder in olive oil rather that the customary pork fat for rilletes, bakes oysters with lemon olive oil and anoints grilled steaks with robust oil. Desserts may be the biggest stretch – extra virgin olive oil ice cream with vanilla bean, Meyer lemon olive oil madeleines and orange olive oil pound cake break all conventions. If they’re half as good as the almost flourless cake, though, they’re welcome on my table. The cake is deceptively simple. You melt good dark bittersweet chocolate, whisk in oil , sugar, egg yolks and just two tablespoons of flour. Then you gently fold in beaten egg whites until no pale streaks are visible and pour the batter in the pan. It works well with a delicately buttery olive oil but I liked it better with a robust oil made from pungent Tuscan varieties of olives. The only real trick is timing the baking. A few minutes too long in the oven and the top and sides get brittle and crumble when you remove the cake from the pan, which ruins the presentation. I know from experience. I served it to my dinner guests anyway. I’d used Valrhona chocolate, after all. But I layered on enough whipped cream and berries to distract them from the mess on the plate. The next cake, I baked five minutes less, and it was perfect. The first strawberries of spring from Swanton Berry Farm in Davenport were a great accompaniment but I didn’t really need them this time around. This cake is so good, it doesn’t require anything but a fork. Preheat oven to 350 degrees with the rack positioned in the middle. Line bottom of a 9-by-3-inch round pan with parchment paper. Melt chocolate in a large stainless-steel bowl placed above simmering water in a large saucepan. Whisk until smooth. Add olive oil, whisking in a steady stream. Whisk in 2/3 cup of the sugar, the egg yolks, then flour and sugar. Using the whisk attachment, beat egg whites at medium speed in the bowl of a stand mixer until they start to foam. Add about a third of the remaining sugar. Beat until whites become opaque and add another third of the sugar. When whites begin to increase in volume and become firmer, add the rest of the sugar and raise the mixer speed to high. Beat until whites form soft peaks when whisk is lifted from the bowl. They will still look slightly wet. Fold half the whites into the chocolate mixture and blend gently. Add remaining whites and fold in just until incorporated and no pale streaks remain in the batter. Pour batter into the prepared pan and bake until cake is puffed and looks dry on top. A skewer into the center should come out clean or with only a few damp crumbs clinging to the end. It should take 30 to 40 minutes, depending on your oven. Place the pan on a rack and allow the cake to cool. It will deflate as it cools. 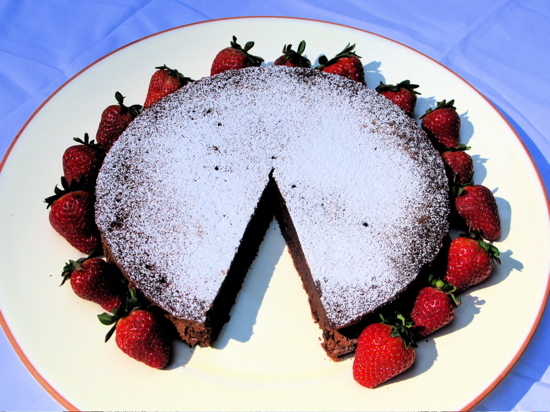 Run a table knife around the edge of the pan and invert cake onto a serving plate. Peel off the parchment paper. Lightly dust the top with powdered sugar and serve at room temperature with whipped cream, if desired. I’ve made olive oil cakes before, but have always made very light cakes (meyer lemon, for example). It has never dawned on me to try chocolate with olive oil, but the more I think about it, the better an idea it is. Once I get some time away from school (I’m a culinary school student and we don’t do much in the way of cakes, alas! ), I know what I’m going to bake. Hey!. Not totally agree with you, but you just gave me an idea for a new eBook regarding \”Chocolate and olive oil, oh my\”. It is related to american chocolate producers. Thanks.